You never know what those rascally Rabbids will be up to next. 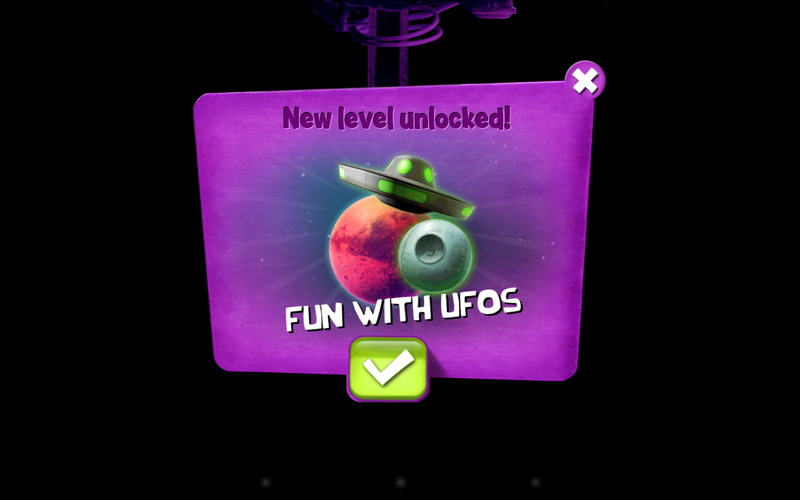 This time out, they’re trying their hand at the Angry Birds formula, but with a twist! And a rocket pack. 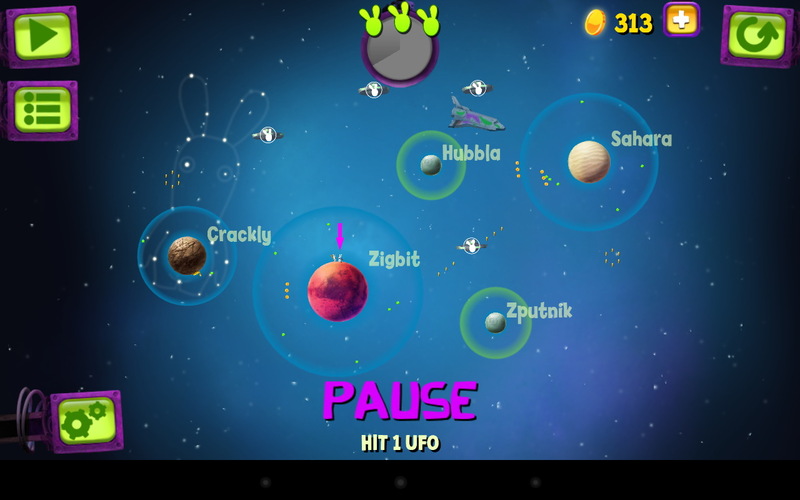 Rabbids Big Bang is like a cross between Super Mario Galaxy and Angry Birds– or, to put not too fine a point on it, a lot like Angry Birds Space as well. Unfortunately, despite coming from a great company that has provided some excellent mobile titles such as Rayman Jungle Run and using some very highly-rated games as templates of a sort, it just seems to lack the kind of focus and direction that would result in a more engaging title. 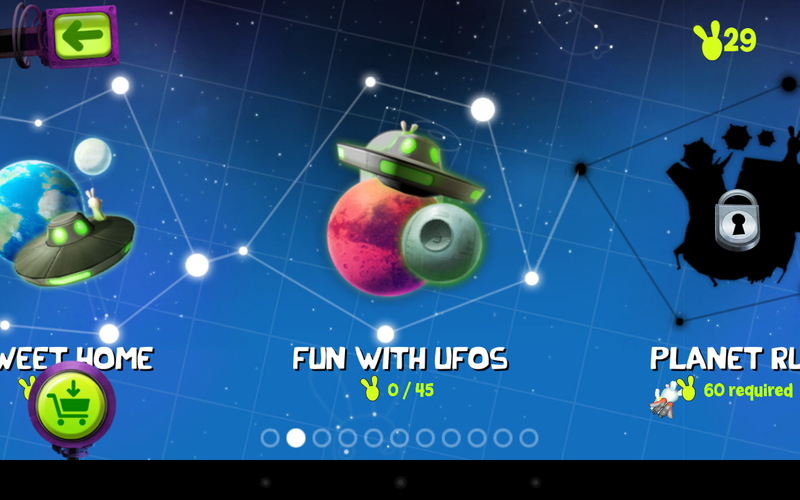 The idea is that, for some reason, the Rabbids are now apparently giants on the order of Galactus or Unicron, but without the chaos-bringing appetites of either. 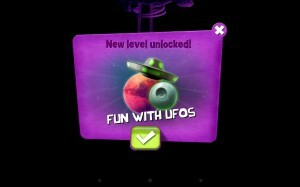 Instead, they’re playing baseball– or rather, Rabbid-ball. After setting a course, one Rabbid twacks the other with a baseball bat, sending them around the planet, through the atmosphere, off into space, and even to the moon and other planets. At its core, it’s a fun premise, and once you get the rocketpack, things really open up. Unfortunately, that’s also around the point things seem to get too chaotic for their own good. Certainly, the Rabbids are known for their wide-eyed, innocent anarchy, but when trying to control things is itself a victim of that unruliness, things start to sour. 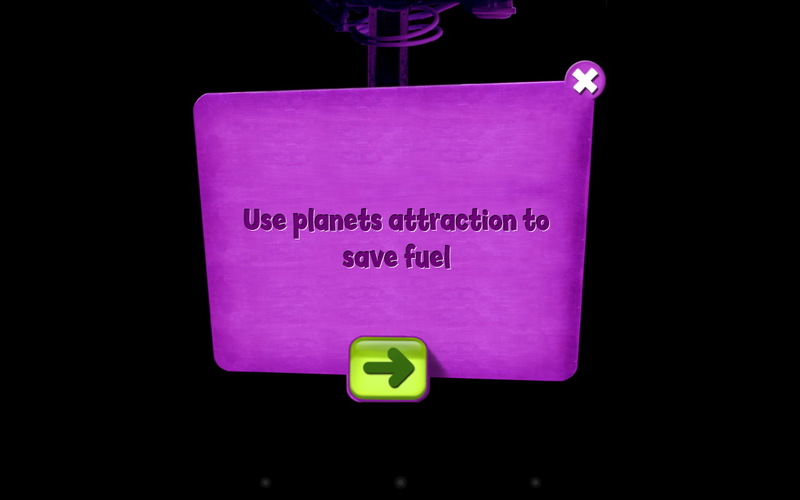 The launched Rabbid is constantly spinning, and you need to touch the screen to help him accelerate with his jetpack to get him where he needs to go. 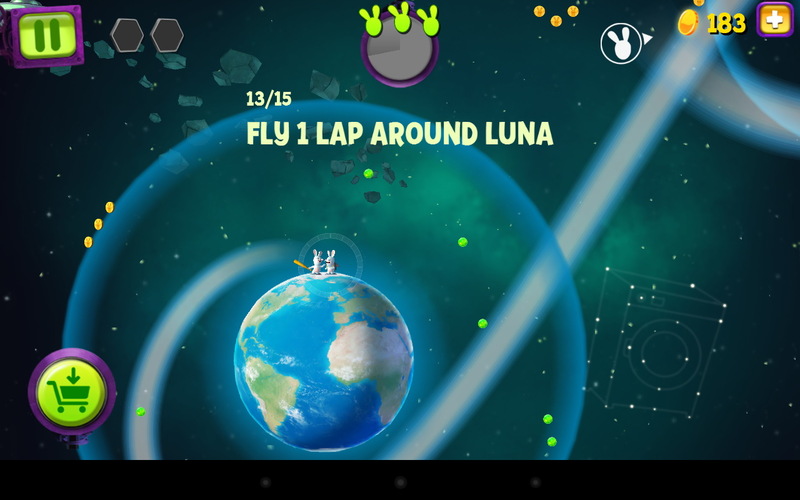 Unfortunately, it seldom seems to work as intended; similarly, the forces of gravity don’t seem as consistent as they do in Angry Birds Space, either. The result is a lot of struggling to try to get on the right course, and running out of fuel or time to get the best score– or both. The truth is that the game isn’t necessarily bad, but it is challenging in just such a way that it feels like you can never quite be sure what you’re doing wrong, or how to correct for it. 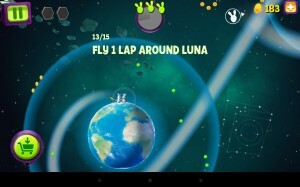 In Angry Birds, it’s largely a matter of constantly tweaking your angles, trajectory, force, and other factors until you find a winning combination. In Big Bang, you’re just kind of hoping for the best, time after time, and occasionally willing to settle for a passing grade, rather than an excelling one. 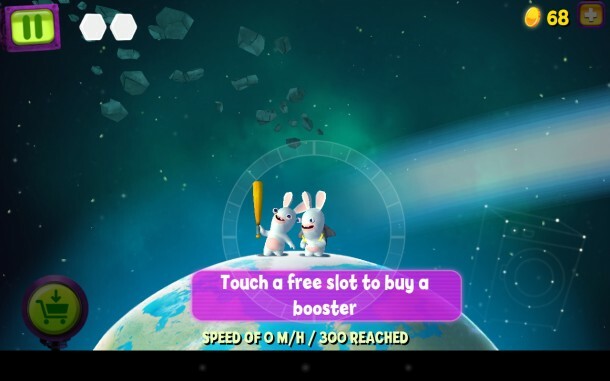 If there is one thing Rabbids Big Bang has going for it, it’s variety in its missions. 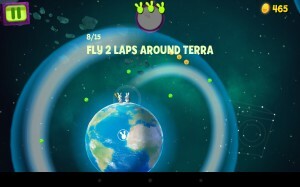 In Angry Birds Space, your goal is as singular as it is simple: Kill all the pigs. 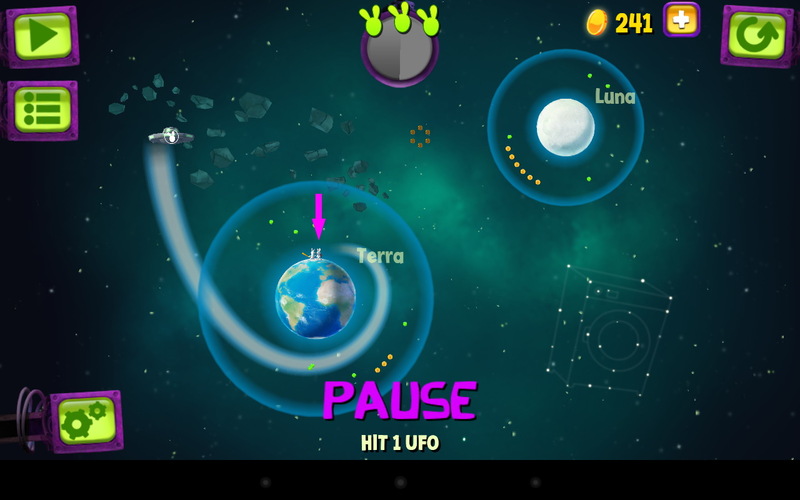 In Big Bang, you’ll be given all kinds of objectives, from circling the planet a certain number of time, landing on one of the other planets, circling one of those a certain number of times, spinning UFOs, chasing visions of toilet paper to a majestic commode in the sky, and more. 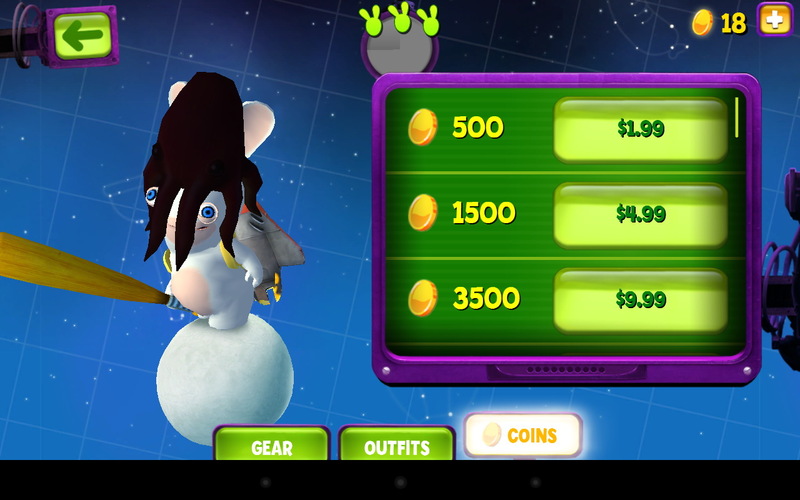 In addition, by earning enough coins, you’ll be able to customize your Rabbid with a variety of options, including an octopus on his head. In the same shop, you can also improve the strength of your bat and the power of your jetpack, but those don’t seem to help as much as one might think. 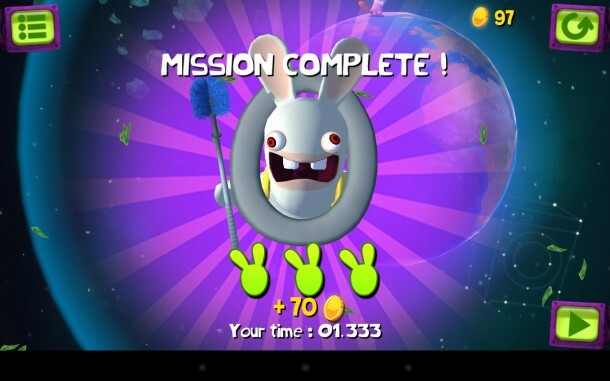 On the down side, the Rabbids don’t really bring their A-game to the comedic value of the game– besides the regular antics of the game itself and the customization, they’ll brush their teeth with a toilet brush when you complete a level. Not much more going on than that, sadly– and these guys have their on half-hour TV show on Nick, so you know there’s more to them than that. Overall, Rabbids Big Bang doesn’t really live up to its name in any appreciable degree. It’s not terrible, but it’s not significantly more than average, either, and even fans of the Rabbids might come away disappointed in this one. In the end, if you play this one, you’ll probably find yourself screaming “DAAAAH!! !”, too.